The revered conductor continued to perform with the orchestra he founded - the Academy of St Martin in the Fields - into his 90s. Sir Neville Marriner has died at the age of 92. The Academy of St Martin in the Fields - Classic FM's Artists in Residence - announced today that Sir Neville had passed away peacefully in the night on 2 October. The Academy's Music Director, Joshua Bell, said: “I am deeply saddened by the news of Sir Neville Marriner’s passing. He was one of the most extraordinary human beings I have ever known. Classic FM presenter Aled Jones made his professional singing debut at the age of 12 in a performance of Handel's Jephtha with Sir Neville Marriner conducting. "I adored the man," Aled said. "One of a kind, truly, and a gifted musician." Born on 15 April 1924 in Lincoln, Marriner was taught the violin, initially by his father, before entering the Royal College of Music at 13. During the Second World War, while still studying – and when so many orchestral players were serving away - Marriner performed with great orchestras including the LSO, under such conductors as Sir Henry Wood. When Marriner was called up during World War II, he served in the Royal Navy, participating in motorboat raids into France. He was invalided out of the Navy with kidney damage. After the war he returned to the Royal College of Music and then went to complete his studies at the Paris Conservatoire. After teaching at Eton for a year, he became a professor at the Royal Academy of Music. He also became a member of the Martin String Quartet as well as of the Jacobean Ensemble, which specialised in the music of the 17th and 18th centuries. Marriner joined the Philharmonia Orchestra as a violinist in 1952, and became principal second violin of the London Symphony Orchestra four years later, remaining in this post until 1968. He recalled that he ‘…larked about with the best of them’, once bombing the LSO’s tour bus with flour bags from a friend’s Tiger Moth plane. In 1959, having been asked to put on a series of concerts for the London church of St Martin-in-the-Fields, Marriner formed his small ensemble. When selecting musicians for his orchestra, Marriner asked himself three questions; ‘Can they play?’ ‘Can they be absorbed into the orchestra’s style?’ and ‘Can we live with them?...If they are miserable devils they don’t get invited back!’ Marriner made numerous recordings with Academy and other orchestras, covering the full gamut of the 18th and 19th century repertoires, and moving into the 20th century with composers such as Tippett and Nicholas Maw. Marriner was the first music director of the Los Angeles Chamber Orchestra, from 1969 to 1978. His success with this group led to offers to conduct major American orchestras in Boston, Cleveland, Detroit, Minneapolis, and San Francisco. For his opera debut, he conducted Mozart’s The Marriage of Figaro at the Aix-en-Provence Festival. He went on to work for several years with the Opera de Lyon. 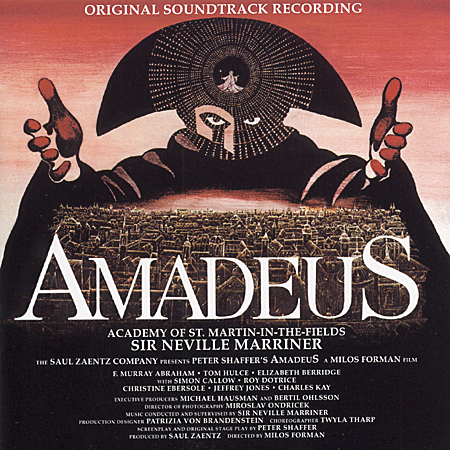 Sir Neville and the Academy recorded all the music for the original soundtrack to the film Amadeus, the album of which became a bestseller and one of the most popular classical music albums ever. Marriner agreed to score the film if Mozart's music was completely unchanged from his original versions. He did, however, add some notes to Salieri's music that are noticeable at the beginning of the film, as Salieri begins his confession. In 1979 Marriner was made a CBE and in 1985, he received a knighthood. In his final years, well into his 90s, Sir Neville enjoyed a career as a freelance international conductor, commenting, "The awful thing about a conductor becoming geriatric is that you seem to become more desirable, not less. I just wish all these offers had come in when I was 30!" RIP Sir Neville Marriner. A great man, a wonderful musician and founder of one of our finest orchestras. He leaves an extraordinary legacy. Here's Sir Neville at the podium in front of his legendary orchestra, playing Mozart. What are your memories of the great maestro? Leave your stories and to Sir Neville Marriner below.